The present day industrial environment demands increased production, nigh efficiency, control of costs, stringent quality controls, etc. Chemical processes have become complex and capital intensive. Outages in plants can be hardly tolerated. To meet such needs of industries, the subject of safety has attained significant importance. Any neglect in these aspects can prove very costly. The engineers are therefore expected to have firsthand knowledge of this subject. Keeping this requirement in view, an attempt has been made to present basic information about safety in chemical and process industries in this book. Case studies provide lot of information and insight into causes of failures and thus give chance for real learning. It is hoped readers will make best use of the case studies discussed at the course material. It is hoped that this course will be helpful for the engineers practicing these areas in the industry and course material will find its place in curriculum of universities and it will serve as a reference to the policy makers in field. While preparing this course material lots of literature were consulted and the practices being adopted by leading industries in the country, viz. 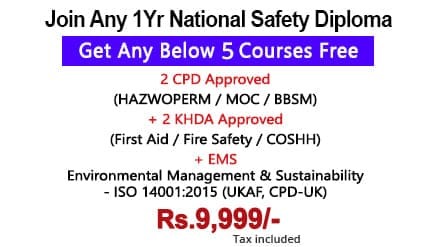 Indian Oil, ONGC, Bureau of Indian Standards, Ministry of Environment and Forest and several other institutes who have published codes, standards, specifications on safety in chemical plants. The assistance taken from their literature, without which this course book would not have been meaningful, is gratefully acknowledged. Candidates/ Delegates who successfully complete and obtain the National Diploma Course (approved by the Govt. of India) could further apply for a membership status with IIRSM. Awarding of the membership is at the discretion of IIRSM provided they have met the required guidelines for the same. Ministry of External Affairs : India & any other ministry of foreign affairs that includes middle east region. Are there any Seminars for Advanced Diploma in Chemical Plant Processing Safety & Management Course? There will be a 12-day seminar session for students at extra fees(not mandatory) at Green World Group Education Center in Chennai, India, only when a minimum number of candidates are enrolled for it. Those who are willing to join the course can visit https://greenwgroup.co.in/enquiry-form/ to fill the details so that we shall make suitable arrangements for your training needs. Experts are available to students on all working days to clarify their doubts in the subjects through emails and telephonic communication. When will i get the certification? Successful candidates are provided certificates within 30 days from the announcement of result. Certificate & Marks will be issued from Central Board of Examination & National Development agency, promoted by the Government of India. Separate certificates will be issued to candidates who passed with distinction and first class.o.